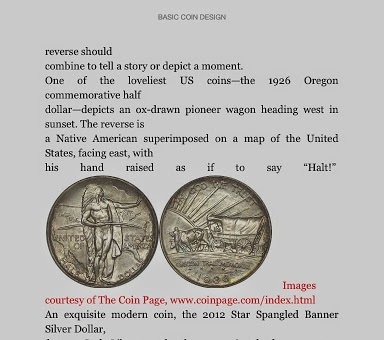 Tony Lawrence's Coins & Stuff: Book Review: Basic Coin Design - is less more? The Amazon blurb for this book states that it is "a startlingly helpful analysis of basic design questions". I'm not so sure about that, but I will grant that it is mildly interesting. The author did a statistical analysis of the basic design elements of U.S. coins and concluded that with one exception using fewer elements leads to a more popular coin. That one exception is the Morgan Silver dollar. Along the way, he discusses the meaning and history of various elements, whether they usually appear on the front or the back (and how to tell which is the heads and which is the tails) and more. As I said, that's all mildly interesting. Seriously, the author expects people to pay $7.99 for a 70 or so page digital book that's difficult to read? If he fixes the formatting and lowers the price, he might sell a few. Otherwise, I can't see it.